Clarity Media is a creator and supplier of Fillomino puzzles, which can also be displayed online as well as in traditional print media. 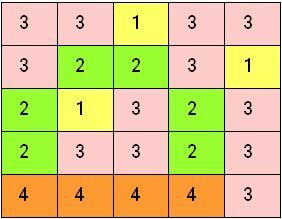 Fillomino is a puzzle that is rarely seen in publication, so if you haven't come across it before, here is how it works (a completed grid is shown to the right using colours to demarcate the different regions). At the start of a fillomino puzzle, you are presented with a grid, usually square, that contains numbers in some squares. 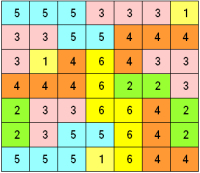 The numbers indicate the size of various polyominos that fit together to fill the grid. Thus a '2' in a square would mean it belongs to a domino, that is, a polyomino of size 2. One of the interesting features of fillomino is that cells containing the same number may or may not belong to the same region in the solution: if they cannot reach each other then they must be separate but often occasions will arise where you will need to work out whether they belong to the same region or not. 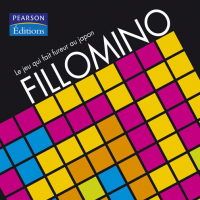 What makes fillomino a great solve is that often in puzzles, there are polyominos that you must deduce yourself that are not given at the start of the puzzle: you in effect have to create polyominos on occasions where none of the squares that contain a value in the start position can any longer reach a particular square, or set of squares, during the process of solving the puzzle. Each fillomino puzzle has a single solution that can be reached through application of logic alone, so guessing is not required to solve any good fillomino puzzle. We can supply Fillomino puzzles in a variety of grid sizes. Standardly we supply 5 x 5 through to 9 x 9 grids though larger sizes can be created, if required. Variety of difficulties available, easy, moderate and hard. Publishers - Please contact us to buy Fillomino puzzles for publication in your book, magazine, newspaper, any other printed media or online.